Background: New generation hybrid solar cell has the promising potential in the energy industry due to the most economics energy device, abundant and flexible design for thin film photovoltaic device. The aim of the paper to increase the performance of DSSC by loading optimum amount of titanium dioxide (TiO2) and reduced graphene oxide (rGO) to maximize the textural and electronic properties of photoanode film. The nanocrystal growth on rGO is an important approach to produce nanocomposite film for DSSCs system, since controlled nucleation and growth affords optimal chemical interactions and bonding between TiO2 and rGO, since the rGO is an electron rich material which attract very strong electrical and mechanical coupling within the hybrid nanocomposite film. Methods: By using a facile and cost effective TiO2-rGO nanocomposite film was successfully formed via sol gel method and using titanium (IV) isopropoxide (TTIP) and rGO as our starting material. The nanocomposite was turns into paste and applied to FTO glass using Doctor Blade Method. The current-voltage characteristics and electron impedance was analyzed to obtained the overall performance of the device. 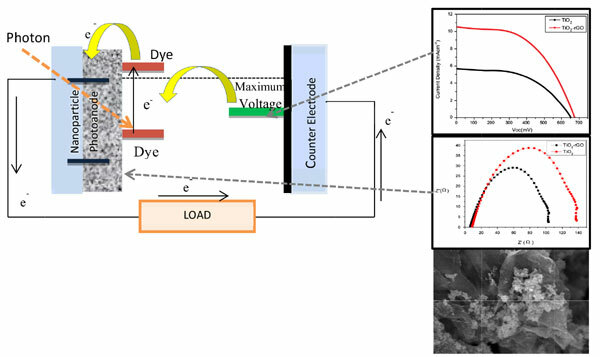 Results: The enhancement performance of photoanode and DSSC can be observed by the HRTEM, FESEM, reduction of band gap, photocurrent density-voltage and electron impedance. From the tauc plot relation, band gap energy of TiO2 shows Eg of 3.20 eV and the TiO2-rGO band gap energy, Eg of 2.64 eV shows that rGO nanocomposite was slightly red shifted towards a higher wavelength of about 500 nm, assignable to a narrowing band gap energy effect. From the FESEM and HRTEM results there are reduction of size in the TiO2-rGO film where the reduction in size for TiO2 attribute from the rGO that as it is an electron rich material/ surface where the electron attraction between Ti4+ and the rGO surface contributes to reduction in size of TiO2. The photovoltaic performance of TiO2- rGO nanocomposite (η = 4.18%) was higher than that of pure TiO2 sample (η = 2.21%) due to the high photocatalytic activity during the irradiation. From the EIS results, TiO2-rGO DSSCs semicircle was decreased from the TiO2 semicircle arc reflecting lower charge recombination and faster charge transfer in the interface. The effective path due to 2D graphene bridge that contributes to effective photogenerated electron separation and transport across the photoanode. Conclusion: As for conclusion, TiO2-rGO nanocomposite sample significantly improved the overall conversion efficiency of DSSCs by approximately two times higher than that of the pure TiO2 sample. The improvements in device properties contributed by the homogeneously dispersed of small TiO2 particles on rGO sheet and the pluronic template helps in increasing the active area as it promotes more porosity on the TiO2-rGO nanocomposite to enhance the dye attachments, thus contribute to the better photocurrent efficiency, and improve electron transfer in the material interface during illumination. Keywords: Graphene, titanium dioxide, dye sensitized solar cells (DSSCs), charge carriers, sol-gel, nanocomposite. Keywords:Graphene, titanium dioxide, dye sensitized solar cells (DSSCs), charge carriers, sol-gel, nanocomposite. Abstract:Background: New generation hybrid solar cell has the promising potential in the energy industry due to the most economics energy device, abundant and flexible design for thin film photovoltaic device. The aim of the paper to increase the performance of DSSC by loading optimum amount of titanium dioxide (TiO2) and reduced graphene oxide (rGO) to maximize the textural and electronic properties of photoanode film. The nanocrystal growth on rGO is an important approach to produce nanocomposite film for DSSCs system, since controlled nucleation and growth affords optimal chemical interactions and bonding between TiO2 and rGO, since the rGO is an electron rich material which attract very strong electrical and mechanical coupling within the hybrid nanocomposite film.